Renjoji Great Buddha (蓮昌寺大仏) is an wooden Buddha stature located in Kanazawa, Ishikawa. It is one of three Great Buddha in Kanazawa. It is 4.85m tall buddha statue built in 1688. It is one of the 3 great Buddha of Kanazawa. Renjoji temple is located on Kokoronomichi which is very popular strolling pass of Kanazawa. Please be careful. Don't touch the statue and keep in the great manner to see this statue. There is small temple located on the left side of the temple. You can enter free. Remove your shoes to entre. 1. use local bus to Higashichaya. The home of one of Kanazawa's three great Buddha statues. Renjoji Great Buddha is a jouroku standing figure, can be found at the temple. 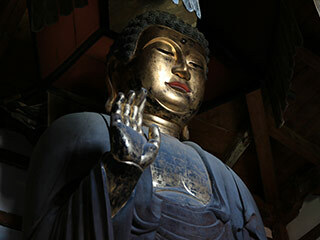 The carved wooden Buddha stands at 4.85m and was created in the Genroku period of 1688 to 1704. Showing peace to all sentiment beings and accepting individual concerns, the form depicts the right hand raised with an open plam and fingers extended, with the left hand down at the figure's side, revealing the intentions of the Buddha. ... is a Nichiren Buddhism Temple established in 1582 by priest Nichijo.